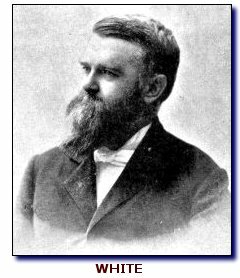 STEPHEN M. WHITE, his service as district attorney of Los Angeles County behind him by nine years, on March 4, 1893, took his seat on the Democratic side of the aisle in the United States Senate, becoming, at age 40, the youngest member of that body at the time. He was also the first native Californian elected to the upper house of Congress. The office he attained clearly could not have been his had he not sided with the overwhelming sentiment in his state against the admission to the U.S. of more Chinese laborers. For Californians in that day, the “Chinese Question” was of paramount concern, though other critical issues loomed. White had co-authored a brief filed in the United States Supreme Court on behalf of California arguing the constitutionality of an anti-Chinese measure enacted by Congress in 1888, as discussed in the last column. That measure voided certificates carried by Chinese who had entered the U.S. legally and were told that if they left our borders, they could, by virtue of those pieces of paper, return. A challenge was instituted on behalf of a man who was denied reentry based on the new provision, enacted eight days before the ship he was on, sailing from Hong Kong, reached port in San Francisco Harbor. The justices unanimously accepted White’s contentions. As a senator, White’s role now was that of a spokesperson for the California position...the position being that continued exclusion of “Mongolians” was essential to protecting jobs for the white work force. Presence of Chinese laborers, many of whom had lain western railroad tracks, was largely confined to the Pacific states. While there was pervasive hatefulness in other regions, particularly the East Coast, toward impecunious immigrants from Italy and other European nations, “John Chinaman” was not perceived, on a national level, as so great a threat as he was regarded here. Anti-Chinese legislation was the product of hard pushing, starting in the 1850s, by western politicians, especially those from California. The 1892 Geary Act, extending the 1882 ban on immigration by Chinese laborers for an additional 10-year period, contained a ruthless measure affecting the Chinese who were here. It required that, no later than May 5, 1893, they register and then carry with them at all times a registration certificate, on penalty of deportation. There was widespread resistance to complying, that resistance spurred by the Chinese Consolidated Benevolent Association—commonly referred to as the Chinese “Six Companies”—which unsuccessfully contested the legality of the act in the U.S. Supreme Court. The compliance date was put off by the 1893 McCreary Amendments for six months. The administration of Democratic President Grover Cleveland held back on enforcing the law—its resistance being based not on moral grounds, but on the cost factor. According to a 1995 book, “Harsh as Tigers” by Lucy E. Salyer, the secretary of the treasury “faced the impossible task—with a budget of only $25,000—of arresting and deporting tens of thousands of Chinese,” the administration estimating the cost at $7.3 million. “The restraint of the administration became intolerable to many Californians who clamored for the prompt deportation of unregistered Chinese,” Salyer notes. Senator White of California, who has given close attention to the Chinese question in all its phases, expressed the opinion that Chinese residents of this country will accept the opportunity to register under the new law extending the Geary act, and says that many of the Chinese have so assured him. The senator says that the only thing which stood in the way of the registering under the provisions of the Geary law before the time for registration was extended by the present congress was the opposition of the Six Companies, which made the fight against the constitutionality of the enactment and meantime prevented the Chinese from complying with the law. Now that the supreme court of the United States has decided upon the constitutional points and has confirmed the right of congress to legislate in the matter, and in view of the fact that this government has shown a disposition to act leniently with the Chinese already here, it is supposed that the Six Companies will withdraw their opposition to registration and permit compliance with the law, especially as they have been warned that refusal will result in wholesale deportation, which would be ruinous to their interests…. Senator White says there has been more talk about the objection of the Chinese to having their photographs taken for filing with their certificates than was justified, and that it has largely died out since the exclusion act became a law. He thinks, therefore, that the Chinese never felt so much repugnance to having their pictures taken as was represented. The belief is general among California people that the Chinese will submit to its exaction and the present marshal of southern California is so entirely convinced on this point that he has established a photograph gallery in Los Angeles for the special purpose of photographing the Chinamen when the rush shall begin. The senator also states that there is no especial feeling among the Americans of California upon the subject, because they think the act will be enforced and they are willing to submit to the presence of the Chinese now here, providing it be understood that no more are to be imported. The only deviation from the letter of the present exclusion laws is the clause permitting Chinese now resident in the United States to return in case they own $1,000 worth of property each in this country, or have $1,000 owing to them here. It is claimed that this will open the door for new Chinese to swear themselves through the custom house. If people would read the treaty themselves, they would see that this idea is wholly untenable. When a Chinaman departs for China leaving uncollected debts or property to the amount entitling him to return, he must make satisfactory proof of the fact before his departure, otherwise he forfeits his right to return. This closes the door against false personation and false swearing. By studiously ignoring this provision of the treaty, the critics of Senator White have been enabled to make out the color of a point against the treaty; and the very people who do it employ Chinese, and are far more favorably inclined to Chinese than is he. White’s views on the treaty were set forth in an interview with the Associated Press, reported in this dispatch of April 19, 1893. Comment has been caused by the announcement that Senator White, of California, favors the new Chinese treaty. To the Associated Press the Senator has given for the first time, the reasons for his altitude on the subject.